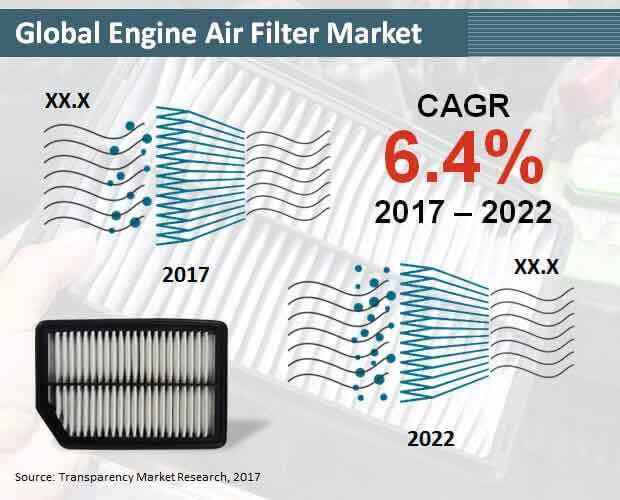 A new report by Transparency Market Research (TMR) finds out that the business landscape in the global engine air filters market is highly fragmented and competitive, as it consists of international and regional players in a large number. These players primarily compete on the basis of pricing of their products and continuously strive to produce cost effective engine air filters in a bid to take on their competitors. Over the coming years, the competition within this market is likely to increase significantly due to constant entry of small-sized players. However, international participants will be able to maintain their positions in the global market, owing to features, quality, and services, they offer. The technological advancements and mergers and acquisitions between the manufacturers and suppliers may also intensify the rivalry between players in the near future, notes the research study. According to the research report, the significant rise in the automotive industry is the key factor behind the growth of the global engine air filter market. Fueled by the increasing trend of owing a vehicle among consumers, the demand for automobiles is escalating substantially. “With the rising concerns over the environmental pollution caused by the smoke emitted by automobiles, vehicle manufacturers are compelled to include engine air filters in their machines. This, as a result, is reflecting greatly on the sales of engine air filters, worldwide,” says a TMR analyst. The advent of electric vehicles, however, may limit the demand for engine air filters in the near future, restraining the growth of this market. Overall, the future of the worldwide market for engine air filters looks thriving. The opportunity in this market is projected to reach US$479.5 mn by 2017 end. Researchers expect it to proliferate at a CAGR of 6.40% during the period from 2017 to 2022 and attain a value of US$652.4 mn by the end of the forecast period. The report presents a comprehensive assessment of the worldwide market for engine air filters on several important parameters. According to the report, paper/cellulose filters have been leading the filter type segment, owing to their remarkably high demand. Over the coming years, this segment is expected to maintain its dominance, rising at a CAGR of 6.30% during the period from 2017 to 2022. Engine air filters find extensive application in commercial vehicles and this trend is likely to continue over the next few years, states the research report. The study further offers a geographical evaluation of this market, as per which, Asia Pacific excluding Japan has been leading the global market, thanks to the presence of prominent automotive manufacturers, such as TATA, Honda Motocorp., and Suzuki. With a CAGR of 7.0%, this regional market is anticipated to retain its leadership throughout the period of the forecast, notes the study.